Academic Quality Improvement Program (AQIP) utilizes a continuous improvement process and provides an alternative process through which an already-accredited institution can maintain its accreditation from the Higher Learning Commission. With AQIP, an institution has continuous quality improvement activities and accreditation becomes a continuous process.) utilizes a continuous improvement process and provides an alternative process through which an already-accredited institution can maintain its accreditation from the Higher Learning Commission. With AQIP, an institution has continuous quality improvement activities and accreditation becomes a continuous process. Accreditation is a process of reviewing the quality of higher education institutions. UMC is accredited by the Higher Learning Commission. UMC uses the Academic Quality Improvement Program (AQIP) process for accreditation. The AQIP Steering Committee's charge is to provide broad-based campus leadership for AQIP participation, accreditation, and continuous improvement. Term ends in December of year listed above. 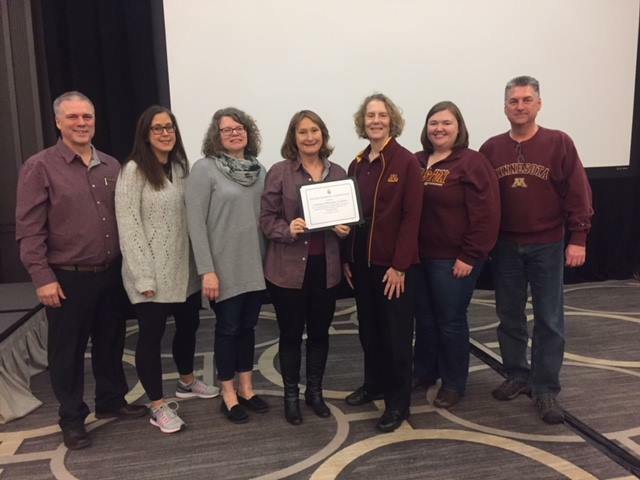 A delegation from the University of Minnesota Crookston attended an Academic Quality Improvement Program (AQIP) Strategy Forum in Chicago November 13-15, 2017. In the photo (below), left to right, are Mark Huglen, professor, Liberal Arts & Education Department; Tricia Sanders, finance director; Sue Erickson, institutional effectiveness; Chancellor Mary Holz-Clause; Barbara Keinath, vice chancellor for academic and student affairs; Lisa Sameulson, interim associate vice chancellor for student affairs; and Jeff Sperling, director, technology support services. The Strategy Forum is central to the AQIP Pathway for accreditation because it brings together teams from other AQIP institutions in an environment that supports and encourages the generation of new strategies and tactics for institutional improvement. The Forum also offers opportunities for participating teams to exchange constructive feedback on their quality systems and specific projects that may eventually become formal AQIP Action Projects. HLC staff and facilitators are also available at the Forum to assist the institutions throughout the workshop.